Web browsers keep track of the websites you have visited in case you want to go back to them later. 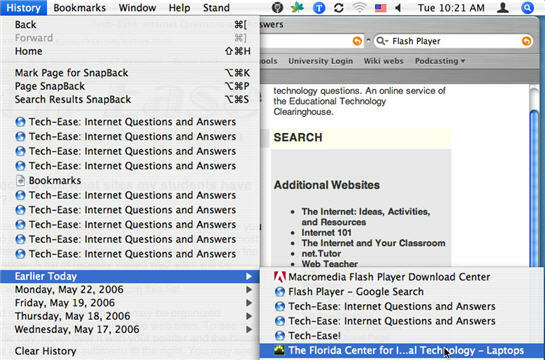 In Safari, you can view a list of the most recently visited sites by choosing History from the menu bar at the top of the browser window. A list of recently visited web sites will be displayed when the History menu opens. You can go back to a previously visited web site by selecting it from this list. If you have visited a lot of web sites, the list may be organized according to the dates on which you visited the web sites. To see the history for a specific day, hover over it with your pointer and the history for that day will be displayed in a submenu to the right. You may see arrows at the top or bottom of the list if there are more items than Safari can display on the screen at one time. The arrows allow you to scroll through the list when you hover on them using the pointer. 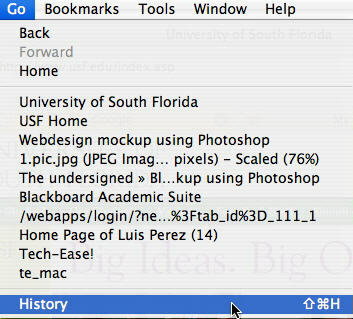 You can access the browser’s history in Firefox for the Mac by choosing the Go option on the menu bar. 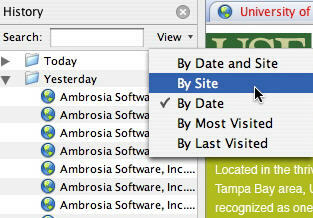 You will see a list of recently visited web sites when you select this menu option. To view the complete history, you can select the History option at the bottom of the list. The full history will open in a small window to the left. 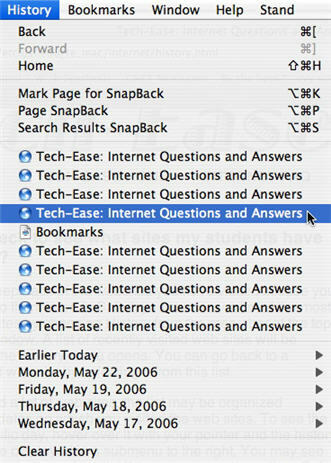 You can sort this list using the various options available under View, or you can search the list by entering a term in the Search bar at the top.